The first two parts of the story Ponniyin Selvan are The First Floods and The Cyclone. Now to the 3rd part The Killer Sword. 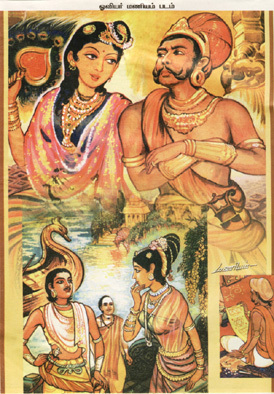 Setting/Theme of the story: Vandiyathevan leaves ArulmozhiVarmar with Poonkuzhali and her cousin SendhanAmuthan. SendhanAmuthan brings an information that the PazhayaraiPirati(KundavaiDevi) wants her brother to stay in the Buddhist viharam at Nagapattinam. Vandiyathevan goes back to IlayaPirati to tell her that the prince is safe. Meanwhile, Nandini, the PazhuvoorRani, invites Karikalan to Sambuvaraiyar's palace. So, when Vandiyathevan meets IlayaPirati, she asks him to stop AdithaKarikalan from going to Sambuvaraiyar's palace. Once AdithaKarikalan takes a step forward, he never turns back. When Vandiyathevan tries to stop Karikalan, he was in vain. By the time, KundavaiDevi brings ArulmozhiVarmar to Anuradhapuram. This is the end of Part 3.